“The personal is poetic, the poetic is political, the political is personal.” This is the maxim that served as the inspiration for Iranian-Canadian artist Gita Hashemi’s current exhibit, “The Idea of Freedom.” Presented at MAI (Montréal, arts interculturels) until December 14, the exhibition includes multimedia pieces featuring video, performance, interactive digital media, and mural installations. 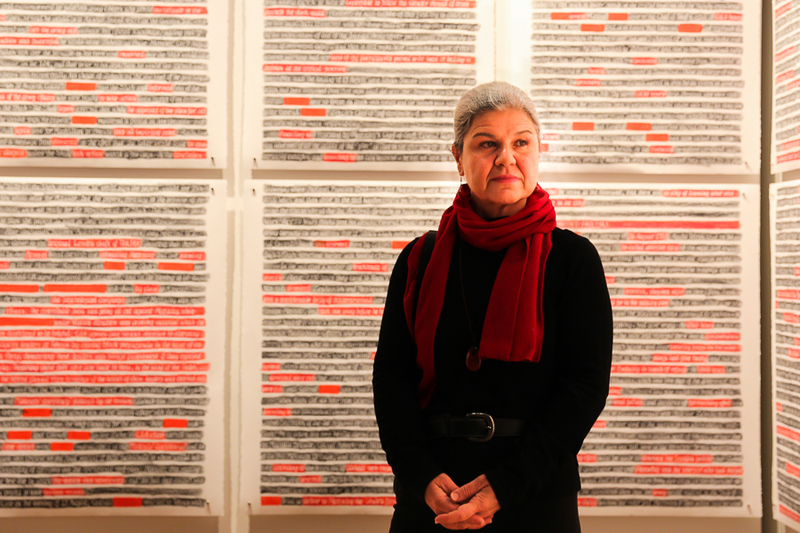 Hashemi drew inspiration for her exhibition from the historical and political situation surrounding the volatile period between the 1953 coup d’état and the 1979 revolution in her native Iran. After voicing her dissident political opinions, Hashemi was expelled from the College of Fine Arts of the University of Iran and compelled to leave the country in 1984. Hashemi advocates and writes about the power of mass activism in movements across the globe, having immersed herself in a group of political activists opposed to the Pahlavi monarchy as a young adult in Iran. As an activist, observer, and victim during these decades of political upheaval, Hashemi created critically retrospective pieces in “The Idea of Freedom.” They look back at a past that is littered with the deception and corruption of state authorities – the American and British Governments, the Iranian Shah, and the (then) new leader of the Islamic Revolution, Ruhollah Khomeini. Since a lot of the pieces actually involve writing, “The Idea of Freedom” represents the literal process of rewriting an otherwise filtered history, while also exposing the near impossibility of doing so. Can we unearth the truth behind a history that has been strained clean? Can we rectify its lies, expose its secrets, and ultimately bring justice to the deserving citizens of Iran? These are the questions that run through the entire exhibition like an invisible string, tying each work to the next. Hashemi insists that these questions – knotted with lies and secrets – must be picked at and unravelled. As you walk inside the exhibition space, Ephemeral Monument immediately commands your attention. The performance video installation shows Hashemi wearing black, writing archival texts of poetry and politics in Farsi on a massive black chalkboard – only to erase and rewrite, repeating the process over and over again. As she is swallowed up in a sea of black, the viewer is left to wonder, what is she mourning for? Considering the inclusion of Pouyan’s quote to describe Ephemeral Monument, the woman in black may very well be mourning for the power and freedom to express herself, a loss that Hashemi is all too familiar with herself. The performance video manifests this loss through the ritualistic act of erasing the chalk writings on the board. Ultimately, what can be seen as the revolutionary or dissident aspect of the work is the impossibility of complete erasure. Try as she may, the woman is incapable of fully erasing the previous markings on the board. History is never a tabula rasa but is tainted with the stains of its forgotten victims’ blood and sweat. Next to the video projection stands the actual board that Hashemi used for her performance. Pathology of an Ouster is a mural installation in which several large canvases contain rewritings, only recently rediscovered, of a report originally recorded by CIA agent Donald Wilber during the 1953 coup d’état. Wilber’s involvement is significant since he helped draft the plans for the coup. The dozen or so mural canvases are striking, making the texts seem like they have been scratched off of their pastel surfaces and alluding to the notion of digging out a long-buried text. The multi-disciplinary collection of works that comprises “The Idea of Freedom” channels the anger and cynicism of those such as Hashemi who have been deceived by their nation’s political authorities. This anger and cynicism, however, is only effectively conveyed by Ephemeral Monument, whereas the other works convey Hashemi’s original motto more passively. Nonetheless, the exhibition is worth visiting for the simple reason that, through art, she addresses a history that remains rich, complex, perplexing, and constantly evolving. “The Idea of Freedom” will be running until December 14 at MAI (Montréal, arts interculturels), (3680 Jeanne-Mance).